It is amazing how we can open our world to others in our world…we don’t see them, know how they look, where they work…but we are drawn to them by this force of likeness and many times “sister hood”. I do not have a big drawing on my site…but I am sure drawn to others. I will add a few names of ladies I visit; I hope they will be as blessed as I. Thank you, Vivian! I certainly feel sisterhood with you, too. I admire your creativity, enjoy reading about family doings, and am edified by your love for the Savior. I thankfully accept this award. If I visit your blog, hopefully leaving a comment now and then, I love you, too! I’m only supposed to list ten blogs, though, for this award. Let’s start with these ladies. Visit them. You’ll be glad you did! This award is for cyber friends. I have loads of friends at church whose blogs I follow, and family blogs I follow, too. Just so you know. Sarah of Coffee at the Cabin. I believe I met Sarah through The Simple Woman’s Daybook meme. She is a dedicated home school mom, a Christian sister, and an excellent writer. Susie of Susiej has such an interesting blog, full of variety. Susie writes for a newspaper in her home state, so it’s an understatement to say she writes well. On her blog you will find the home for the Give What You Grow endeavor, a sort of Victory Garden thing. or Desert Living Dubai Style makes you want to visit Dubai, with her stories and photography. She includes family stories, as well as give-aways. is a Christian sister who humbles me with her loving spirit. We met through The Simple Woman’s Daybook. Susan is uplifting, loving and encouraging to me. is the most bundle-of-energy person and blogger I know! On her blog, you will read of the on-going remodeling of the 100+ year old home she and her husband are doing, recipes she is creating, give-aways and memes. Whew! Mom24 of 4everMom tells of family life in Ohio, with an honest look at life’s ups and downs, and a spirit of making the best of things in these difficult times. Her family is Jewish/Christian, which also puts an interesting spin on things. is a busy, back-to-basics gal living in a remote area of Australia. Linda recently graced me with the Lemonade Award (as in, When life gives you lemons, make lemonade!) which I have not yet passed on. Thank you, Linda! 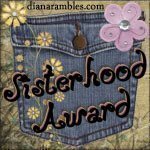 You will learn a lot about life in Linda’s corner of the world from reading her blog. Also, Linda has friends all over the world whose blogs are also well worth reading. is also a friend met through The Simple Woman’s Daybook. She and her husband have three very musical boys, and do some interesting traveling together. I simply enjoy her blog. Oh! I forgot to mention that Barbara is an excellent scrapbooker, for all you enthusiasts out there. Storyteller of Small Reflections. This friend, who prefers to remain “a nonny mouse” as she would say, is a busy retired teacher in Southern California. Her blog specialties are wonderful, inspiring quotes, collected over a lifetime, an upbeat attitude, and lots of photography which make you want to move to her locale! Melanie of New Creation Cottage	is one of the cheeriest gals I know on the internet. She is a hospice nurse who has this to say about her life: “In all times, the good and the bad, Jesus has been at my side.” Melanie is an encouragement to me, too. So, these are my nominees. I do hope you all will accept this award. It will be fun to find out who you nominate in turn. And, Thank you again, Vivian!